A Greenpeace activist protests outside the World Conference Center in Bonn, Germany, where the World Heritage Committee is holding it's annual session. 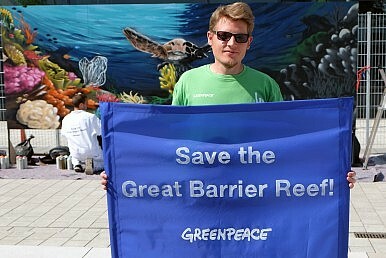 The Diplomat‘s Luke Hunt speaks with experts about the preservation of the Great Barrier Reef. Diplomat correspondent Luke Hunt recently covered the 39th session of the World Heritage Committee in Bonn, Germany, and its decision on whether to list the Great Barrier Reef, off of Australia’s northeast coast, as endangered. It is an issue he has followed extensively, including assignments on the reef and interviews with scientists, environmentalists, politicians and bureaucrats over it’s ramifications for many months. He was on hand when the committee announced it had unanimously adopted a $1.5 billion, 10-year plan designed to secure the reef’s future and felt the relief as the Australian contingent realized the reef would not be listed as endangered. He spoke with Russell Reichelt, the chairman of the Great Barrier Reef Marine Park Authority, Dermot O’Gorman, the chief executive officer of the World Wildlife Fund in Australia, and the Australian Environment Minister Greg Hunt (no relation). A new plan to protect the natural wonder enjoys rare bipartisan support in Australia.